Old Mountain Black Mini Wood Cook Stove is cast iron. 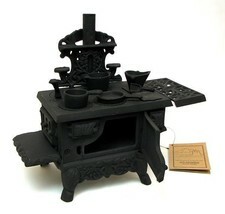 Toy Replica of an old time wood stove, with accessories for decoration only. NOT FOR USE AS A HEAT SOURCE. 12"W x 11"H x 5"D. Made of cast iron, this adorable replica of the old wood cook stove is a reminder of days gone by. Days when they were used in railroad cars, homes and business as not only a source of heat but also to cook on! This is not recomnmended for use. NOT FOR HEAT OR COOKING. Decoration only. Check out my other items! Be sure to add me to your favorites list!